posted by calgarygrit at 2:30 p.m. Honestly, I feel like I read more news than almost any of my friends, yet I knew next-to-absolutely-nothing about his environmental record... now I think he's pretty a-okay and I give him more credit - at least he's got some ambition I didn't see before. I agree McG had (by far) the best campaign... even if he wasn't an incumbent with a Green Energy Act I might've preferred him. Hudak was an epic fail and lost a perfect opportunity to seize power. Negative bitching with no single idea, total turn-off to immigrants and people who are concerned about immigrants, not to mention queer people and voters who are concerned about them. Hudak's campaign was pathetically slim on substance; he deserved to lose. Looks like McG will get his no-coal-by-2014 wish; if the economy turns around internationally, he may get a 4th term. By Jacques Beau Verte, at 5:21 p.m.
CIHI issued a report on wait times in Canada which showed McGuinty's claim to be false, and yet the media, with the likes of highly-paid Liberal war-room manager Warren Kinsella among their midst, refused to challenge him on it. 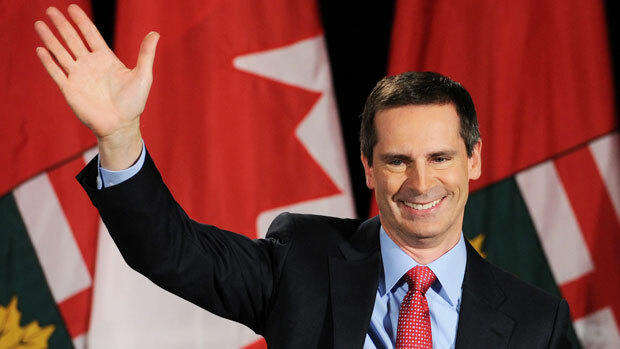 Of course, McGuinty could afford to "stay positive" as well, since the so-called "Working Families Coalition" had promised his buddies that they would spend about twice as much as any of the Political Parties were allowed to spend, all with the sole purpose of attacking Tim Hudak. Are you talking about this report? Ontario -- first in hip and knee replacements and cardiac bypass surgery. By Anonymous, at 11:18 p.m.
As for McGuinty's environmental record, his government has been strongly committed to closing the Nanticoke coal plant... for 8 years. The plant was supposed to be decommissioned in 2009. There has been a host of subsidies and feed-in tariffs for wind energy. However, the role of wind in Ontario's energy mix remains small. Ontario's energy needs run at about 33,0000 MW, whereas wind farms can produce 1300 - in theory. But in practice they usually operate below capacity (for instance, Ontario's wind farms are producing only 638 MW at the moment). If Ontario had a sensible energy plan (like building another nuclear plant), we could have closed Nanticoke a long time ago, without raising electricity prices. Instead, we are adding new generating capacity at a rate far too slow to meet Ontario's impending energy shortage. About 80% of our energy infrastructure is old and likely to be decommissioned - if we built nothing we'd have about a 30,000 MW supply gap by 2025. But instead of refurbishing, and adding cheaper green sources of energy (like nuclear power, or new hydro projects), we are adding expensive wind plants, which will raise energy costs, are unreliable (because wind varies across time), and probably insufficient to meet Ontario's energy needs (which, in practice, means we'll be importing electricity produced by coal-plants elsewhere). By hosertohoosier, at 6:22 a.m. I'm not challenging you (I accept what you say), but I'd like to know how you know these things. What do you read to have this kind of knowledge always at your fingertips? I've read (slighter) criticism of the Green Energy Act, nothing as substantial as yours. Personally, I feel we're strong enough in vital areas such as security and wealth that I can vote with an environmental bent. Accepting all you say, I still don't regret voting for McG's candidate... Hudak and Horwath don't measure up environmentally. Still, I routinely wish I were better informed. By Jacques Beau Verte, at 11:05 a.m.
Nuclear's not cheap. It can take anywhere from and optimistic $4-9 billion (US dollars) to a more realistic $6-$12 billion to a pessimistic $26 billion. Part of the hydro debt charge that Hudak was planning to drop, well that's from "stranded debt from the old Ontario Hydro's nuclear program." And they take years to build. Shortest is 3.5, but there are quotes of 7-12. With people fighting windmills and gas power plants, expect a long and fierce battle on any nuclear plant built within 100 miles of anything. So, cheap and fast is out when it comes to nuclear. @11:18, if you cite a report you should verify that it says what you claim: the report says that Ontario is third in Cardiac Bypass surgery (fourth by median). Not first. And the suggestion has been made that doctors have been told to only "start the clock" on hip surgeries after the patient has been scheduled for surgery, not when the determination has been made that the surgery is required - which is often many months earlier. By Anonymous, at 3:34 p.m.
"Ontario's energy needs run at about 33,0000 MW,"
Hmm. Interesting stat. But incorrect. And @1:23, while "Nuclear's not cheap", it's certainly a whole lot cheaper than wind or solar. The problem with the stranded debt was built over decades, and arose because nuclear was priced below cost. Now, we're pricing solar and wind below cost and you're saying this is a good thing? By Anonymous, at 3:44 p.m.
McGuinty is spending billions of our tax dollars on a deal with Samsung for windmills. Because of the secondary effects of windmills, they result in an INCREASE in CO2 emissions. By Anonymous, at 1:32 p.m. The annual peak may be 27,000 MW, but you have to produce more than that, because the energy grid is not perfect - lots of electricity gets lost in transit. The 33,000 figure was from this report: (http://www.mei.gov.on.ca/images/content/en/supplygapchart2027.gif). And yes nuclear power has high construction costs, and will take a while to produce. However it is a far better zero-C02 workhorse than solar or wind because it is reliable. Making the energy mix reliant on a variable (the amount of wind and sun we get) is a recipe for either rolling blackouts, or expensive energy imports from coal burning America. For instance, wind farms were producing 628 MW during my last post. As of 6:09 Sunday, they're producing 40 (http://www.ieso.ca/imoweb/marketdata/windpower.asp), out of a capacity of 1300. What is more, most of the assumptions for solar plants and wind farms are based on the fallacy of a favourable site. The more wind farms we build, the fewer favourable sites will be available - reducing the average yield on each additional farm. As for finding information, the quickest way is to search for likely chart headings in google image search, and then to go to the more reputable sites you find. Eventually you remember places that are good general sources, like the public accounts websites of various governments. It doesn't hurt that I enjoy finding data, especially when it forces me to update my mental model of how the world works. By hosertohoosier, at 6:13 p.m. I like to update my mental model as much as anyone I know; still, your information skillz drive me mad (with envy). I tend to look at news-ish sites rather google... seems obvious once you say it; thanks for the recommendation. By Jacques Beau Verte, at 12:25 p.m. The way things are going in the NDP race, it's shaping up to be exciting (moreso than the one Layton won). The Liberal race is sort of, well, "boring" (right now). Really wonder if the media attention the orange team will obviously garner in this contest will further plant the NDP as "the progressive party" in the public's mind, and further relegate the red team to "third party, nice to have you in Parliament to help out". By Jacques Beau Verte, at 3:13 p.m.
By margahayuland, at 8:17 p.m.
By Unknown, at 7:05 p.m.
By Jasmine Thompson, at 6:24 a.m.
Greetings! Thanks for inviting me here. I found so many interesting tips here, especially in discussing. Besides, I want to add here another valuable advice - there is a service www.custom-paper-writing.org in which experienced writers are ready to help for students from all over the world 24/7! Their main principle is to appreciate their customers. By Anna, at 7:33 a.m.
By khaled ali, at 4:34 a.m.
By khaled ali, at 4:35 a.m.
By Obat Gatal Pada Selangkangan, at 3:39 a.m.
By xccc, at 8:44 a.m.
By Thu Lê, at 11:23 p.m.
By adham washim, at 5:44 p.m.
By hooda, at 10:09 a.m.
By ngocanhng, at 10:13 p.m.
By Melony Fisher, at 8:29 p.m.
By Rize, at 9:37 p.m.
By Abdul Ajiz, at 9:19 p.m.
By elkamaal elkamaal., at 7:55 p.m.
By elkamaal elkamaal., at 8:06 p.m.
By elkamaal elkamaal., at 8:23 p.m.
By risa icha, at 2:44 a.m.
By Sali Saputra, at 10:07 p.m.
By jellygamat murah, at 10:28 p.m.
By Rebecca Alexandra, at 1:58 a.m.
By Lutpi Kurniawan, at 8:20 p.m.
By Amel Aulia, at 3:41 a.m.
By Tony Agen Jelly Gamat, at 12:07 a.m.
By Tony Agen Jelly Gamat, at 3:29 a.m.
By Dela Yunia, at 12:02 a.m.
By Pengobatan Alami Terbaik, at 4:57 a.m.
By Rayanaly, at 2:59 p.m.
By risa icha, at 3:00 a.m.
By Zihan Amelia, at 2:29 a.m.
By easy your sustenance, at 11:07 p.m.
By Lutfi Kurniawan, at 3:45 a.m.
By Zihan Amelia, at 1:24 a.m.
By Zihan Amelia, at 3:49 a.m.
By Obat Sakit Tenggorokan, at 3:40 a.m.
By Zihan Amelia, at 3:12 a.m.
By liyaalicia 98, at 9:07 p.m.
By Anisa Marlina, at 2:10 a.m.
By icha charisa, at 11:10 p.m.
By Lutfi Kurniawan, at 3:48 a.m.
By Zihan Amelia, at 2:56 a.m.
By Ini Herbal, at 2:10 a.m.